How Often Should You Do Ab Workouts? Sculpting abdominal muscles and toning the tummy requires the same effort as strengthening any other muscle group of the body. If you are aiming to get a spectacular six pack, you might be spending a lot of time working out for the desired abs. This strategy is not very successful to develop core muscles. For amazingly toned stomach, you have to give the muscles some rest between the work outs and follow a strict diet and cardio routine. For perfect ab muscles you should do ab workouts three times a week and give at least forty eight hours to rest your core muscles. During this resting time the muscles recover from fatigue and there are fewer chances of injury and over exertion, which is not helpful to develop core muscle strength. An ideal ab workout is a mix of upper and lower ab exercises combined with yoga and pilates for maximum effect. 20-30 minutes of this mixed routine is sufficient and gives much better results than spending a lot of time doing crunches only. Before starting these exercises do some warm up routine and gradually build on. Take it easy in the beginning and do 10-15 reps of each exercise. You can choose from reverse planks, crunches, pelvic tilts, pelvic lifts and trunk twists. These are simple routines and you can do them at home. There is no need to buy any fancy gadgets or get expensive gym memberships. How often should you do ab workouts? Apparently not every day. If you want a perfectly sculpted and toned abdomen you must give your muscles some time to rest and recover. Most of us have desk jobs and sitting for long times can lead to bad posture habits. We tend to stoop and our shoulders are often hunched forwards. The posture can get worst with excessive ab workouts. When you do a lot of crunches daily, the abdominal muscles become tauter and can aggravate the stooping. So it is necessary to give ab muscles a break for a better posture. The best thing is to correct the posture and posture related problems as well. Abdominal muscles are designed in a complex way. They require different techniques to strengthen them and working out daily just for the abs is not a very effective way to get six packs. They have a lot of type 1 muscle fiber and to develop these types of muscles you need to give them some time for rest and recovery. Workouts done twice or thrice a week give much better results than every day ab workouts. The abdominal muscle complex is made up of four groups of muscles and in order to tone all of them, different types of exercises are required. If you stick to doing one kind of exercise like daily crunches only the rectus abdominus muscle will get toned. Other muscles, namely internal oblique, external oblique and transverse abdominus, will stay weak and the core strength will not be achieved. The best way to develop all these core muscles is to do a variety of exercises at recommended intervals. Why it helps: A side plank is more effective and challenging than the usual plank and since you have to stabilize your body on two points of contact the core muscles have to work harder for stabilization. How to do it: To do a side plank, lie down on your right side and place your elbow beneath your shoulder. Put the left hand on your hip and keep your legs stacked. Now lift your hips off the floor and balance on your feet and your elbow. Hold on for as long as you can in the beginning and then try to hold for half a minute. Change sides and repeat. Why it helps: This is a very effective exercise that combines stability, cardio and strength training. It also burns calories and is an excellent core strengthening routine. How to do it: To do this drag, you need a clean area where you can move for ten to twenty yards. Choose something which can glide on that floor surface with least friction. If the area is carpeted you can use plastic bags; and if it is tiled surface you can use towels. Put that cover under your feet and assume the starting posture of a push up. Then drag your body forwards on your hands and move forwards like an alligator. Go as far as you can. Why it helps: This amazing ab sculpting workout strengthens all core abdominal muscles and you can adjust the tempo according to your requirement and maximum results. How to do it: Sit on the floor and lean back putting weight on your elbows and forearm. Keep your legs straight in front of you. Then bend the right knee and put your right foot on your left knee. This is the Passé position. Now squeeze your abs and lift your legs off the floor while maintaining the passé position. Then lower your legs and keep them a few inches above the floor. Repeat six to eight times and then change sides. 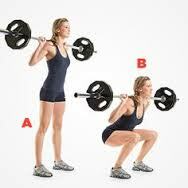 Why it helps: This squat is extremely effective for core stability and strength. It is proven for activating abdominal muscle fibers. How to do it: You need a barbell for this exercise. To start you have to stand straight with the barbell on the back of your shoulders with your feet shoulder width apart. Keep your back flat and lower your body with the knees bent and hips backwards. Then stand again and do three sets of ten reps.
Why it helps: This exercise is great for abdominal muscle fiber activation and it also teaches you to breathe correctly. How to do it: To do this exercise you need to lie down on the floor and lift your legs straight up to an angle of 45 degrees. Keep your arms straight and extended. Now lift your arms and entire upper body and bring your arms parallel to your legs. Inhale while you lift your shoulders and exhale when you bring your arms parallel to your legs. Stay there for some time and breathe normally. Then slowly go back to starting position. Why it helps: If you are looking for a real challenge for your abs, this is the ideal workout for you as it engages all the abdominal muscles. How to do it: Lie down on your back and put both hands at the back of your head. Keep your legs straight and feet pointed towards the ceiling. Now lift your legs for about six inches and keep them straight. Contract the abs and bring your knees towards your chest and try to lift your hips. Then get back to the starting point and repeat for six to eight times.